Did you know that more than half of all the master bathrooms in America are less than 75 square-feet, forcing most couples (or even families) to “make do” with limited space? Smaller spaces require organization. Too many toiletries, cleaning products and hair dryers can make a small space feel even smaller. Clear off the sink, clean out the medicine cabinet and remove products from under the sink. Take stock of what you own and what you use on a daily basis. Pare down the excess and keep only what you need. Use baskets and bins to provide order to the items you plan on keeping. Mirrors have the ability to visually double the size of your bathroom. By reflecting natural light, they can give your bathroom the appearance of being more open and bright. Full sink to ceiling mirrors create the most significant illusion of increased space. But if that isn’t an option, consider a single mirror in a unique shape to create a point of visual interest. Two sinks can make sharing a bath much easier, provided you have the space. Many newer vanities can accommodate two sinks. You’ll need to allow at least five feet when adding a vanity for double sinks. No room? Consider side-by-side, small pedestal sinks instead. No budget for new sinks? Change your faucet with one of today’s newer high arc styles. The longer neck and spout of these faucets make it easier for both of you to have the room to brush your teeth, wash your face or even shave at the same time. A dark room feels cramped and crowded, while natural light can make the bath feel open and larger. Add sheer blinds or apply a film treatment to your window to let in more light, while still allowing for privacy. Consider changing the lighting fixtures as well. Overhead lighting tends to add unflattering shadows to your face when you look in the mirror. Try installing wall sconces level with the top of the mirror. This puts the light in front of you, creating the most optimal lighting for grooming. Transform your shower into a spa experience with a massaging shower head with multiple spray settings. This will allow you to choose and personalize your settings. Choose a vigorous massage for him or a soothing rainshower for her. Let’s get started on your dream bathroom today! 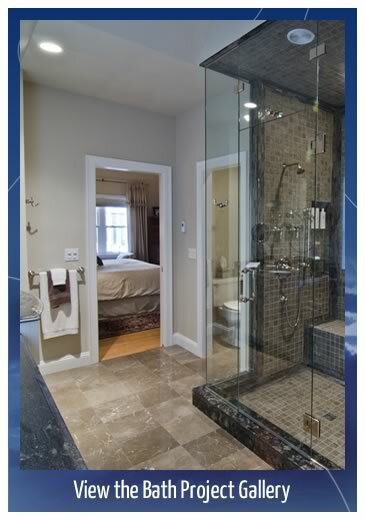 Let our team deliver your dream bathroom! Call G.M. Roth Design Remodeling today at (603) 880-3761 to schedule a complimentary in-home consultation with one of our talented designers.